The gardens of tomorrow offer a great challenge, namely what would a garden of the future look like? With the global population increasing every year (according to Worldometer, which monitors population figures based off of data received from the U.S. Census Bureau and the United Nations, the world’s population hit 6.7 billion today, though other sources claim we reached that figure back in September of 2008), land is going to eventually become a hot commodity. In Walt Disney World’s Tomorrowland, whose message is the tomorrow that never was, and where unpaved and structure-free space is limited, the patches of plant life are as bold as Tomorrowland’s vision. Japanese yews are trimed into space-age pod like structures, modern architecture is framed by hard-lined and pointed palms and agaves, and vivid life affirming palates are chosen for the futuristic flowerbeds. In some cases, the rich soil used to grow plants today has been replace with martianesque sandy soil. 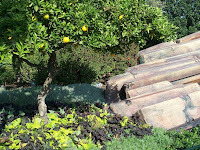 Disneyland’s Tomorrowland, while offering the same visual flavors, also proposes a more functional use for their futuristic foliage, as every piece of vegetation is edible. So, not only does the tomorrow look bright, it also tastes bright. Embrace hot, vibrant color – for example, oranges, reds, and yellows. Create patterns with big, bold-leafed plants. Emphasize texture by juxtaposing different leaf forms, such as broad, spiky, or round. Enhance contrasting colors by planting annuals in solid bands, such as racing stripes of red begonias and purple pentas. Walt Disney World’s favorite futuristic plants: Large-leafed Traveler’s palm, Zamia, cycads, Yuccas, and Dracaena. Aww I love all the gardens of WDW - thank you for sharing them with us!